Foster a love of wildlife in children with this Coveside Bat House Kits Club Pack. This set of 6 traditional, unassembled shelters offers a fantastic project for scout groups, allowing kids to learn building skills along with the benefits of bats. The precut pieces of white pine assemble together easily with the included hardware, and form a single chamber house for up to 12 bats. This chamber measures 0.75" deep, and a ventilation gap across the front of the piece prevents bats from overheating. Rough hewn wood and plastic screening on the home's interiors allow bats to easily grip and enter the pieces, and their flat backs attach to a post, pole, or building. The downward angle of the roof directs water away from each shelter, and their pine bodies will weather over time for a lovely, aged look. A hammer and Phillip's screwdriver (not included) are required for assembly of each unit, and the six pack is a wonderful craft for a classroom or scout group. Celebrate bats and offer them homes with this Bat House Kits Club Pack. Assembly required. Made in the USA. 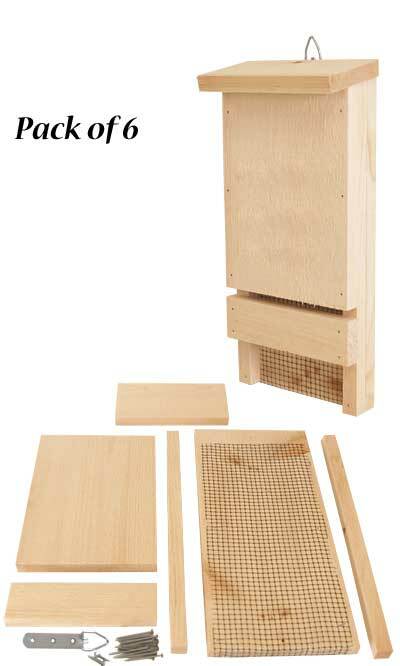 Note: This club package contains 6 of the Coveside Bat House Kits.